... and now, in after-hours trading, it is up 116% to 27. This has got to be the strangest trading activity I've ever seen outside of chop-stock land, and that era is long over. Adding comic relief to the whole situation, meanwhile, are the naked shorting conspiracy types, most recently the wacko CEO of Overstock.com, Patrick Byrne. 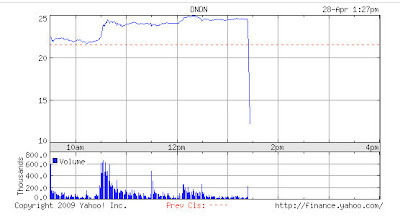 They've put Dendreon on their lengthy list of victims of naked shorting. Forensic Tracy Coenen had a memorable fisking of a recent Byrne blog post the other day.